Hampton Bay Ceiling Fan Light Kit Roanoke LED Indoor Outdoor Natural Iron 48 in. Introducing a better way to cool with the new 22 in. Stile enclosed ceiling fan and light combination. This trendy, space saving fan is damp rated so not only can it be used indoor, but in a covered outdoor space as well. LED Indoor/Outdoor Brushed Nickel Ceiling Fan can be used both indoors and outdoors in small areas. Has a unique blade design as well as a holophane glass light kit for a very modern/retro look. The 14-Watt Samsung LED light kit will provide enough light as well as energy efficiency. 1 X Ceiling fan. Blades: 7cm x 16cm (L x H). -Energy saving item, rated power only 7 W. -Designed for those who can not feel comfort with the air conditioning or fan of strong wind. Leaves turn the quantity : 6 leaves. Brushed Nickel Finish. This Ceiling Fan operates on standard US 120 volts. Two 9W LED bulbs included. Important Note: This Ceiling Fan operates on standard US 120 volts. Like all Hunter ceiling fans, this fan can save you up to 47% on cooling costs. To put this in perspective, the wind chill from a Hunter ceiling fan will keep you as cool at 76 degrees as you would be at 82 degrees without a ceiling fan. Nobel Bronze Finish. Manufacturer Color Finish Nobel Bronze Finish. Like all Hunter ceiling fans, this fan can save you up to 47% on cooling costs. To put this in perspective, the wind chill from a Hunter ceiling fan will keep you as cool at 76 degrees as you would be at 82 degrees without a ceiling fan. Includes four-light fitter with cased white glass and four 9.8W dimmable LED bulbs included. Brushed Nickel finish. The sleek design and state-of-the-art motor make this fan so simple yet so powerful. Choose among two blade finishes white or white oak and select from 3-speed settings for refreshing whisper-quiet airflow. Dual-mount installation for standard and sloped ceiling application only, cannot be flush mount. Hunter 54 in. Brushed Nickel Finish with 5 Burnt Walnut / Light Grey Oak Reversible Composite blades included. Installer's Choice three-position mounting system allows for standard, angled or low ceiling mounting. Big ceiling fan with enough airflow which is suitable for a big room. This fan has classic look and DC motor inside. You can add a suitable light kit under this fan if you want. Reverse button on transmitter for the users' convenience. 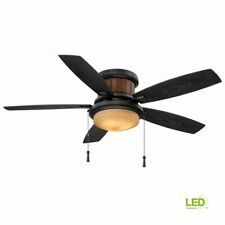 HUNTER 52" Ceiling Fan Model HR 21316. Hunter Model HR 21316. "Aged Umber and Fontana" Fan Finish w/ 5 Reversible Blades: "Dark Walnut" or "Cherried Walnut". Fan Finish: Aged Umber and Fontana. After nearly 120 years, they wouldn’t have it any other way. Noble Bronze and Brushed Nickel Finish. This Ceiling Fan operates on standard US 110 volts. Installer's Choice three-position mounting system allows for standard, angled or low ceiling mounting. Hunter 52" Brushed Nickel Ceiling Fan w/ Light Kit- Flush, Std. or Angled Mount. This Ceiling Fan operates on standard US 120 volts mains power. Brushed Nickel Finish. We will upon inspection, replace your refurbished fan with an equivalent refurbished Hunter fan freight prepaid. For interior and outdoor use under a covered ceiling. Achieve a modern touch for your interior design with this 23 in. drum-style pendant fan. It is sure to catch everyone’s eye with its unique design and functionality. Blade Color (Side 2) Blonde Oak. Low Profile housing is specially designed to fit flush to the ceiling and is ideal for use in rooms with low ceilings. Length 52 in. Blade Color (Side 1) Fresh White. Brushed Nickel Finish. Installer's Choice three-position mounting system allows for standard, angled or low ceiling mounting. This Ceiling Fan operates on standard US 110 volts. Two 9W LED bulbs included. The 48 in. Federigo Matte Black ceiling fan provides a fantastic energy efficient fan and light combination. This three-speed fan includes LED-light sources for the down-light and a side/uplight. Ceiling Fan Width (in.). Important Note: This Ceiling Fan operates on standard US 110 volts. We will upon inspection, replace your refurbished fan with an equivalent refurbished Hunter fan freight prepaid. Airflow Efficiency. 52" Ceiling Fan. Brush Nickel Finish. Manufacturer Color/Finish Brush Nickel Finish. 13° Blade pitch. Ceiling to bottom of fan 12.02" 13.02" 46.02". Ceiling to bottom of fan blade 10.95" 11.95" 44.95". Bright brass motor and blade holders. 52" 5 Blades. 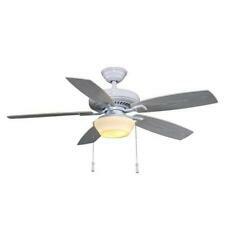 Hunter 42" Casual Low Profile Ceiling Fan - Snow White Finish w/ Light Kit. 42" Casual Ceiling Fan. Swirled Marble Glass. Flush Mounting. Snow White Finish. 13° Blade pitch. Snow White Blades. Ceiling to bottom of fan 8.80" -- --. Hampton Bay Sailwind II 52 in. Uses one 60-Watt candelabra bulb (included). Oil rubbed bronze finish. Indoor and outdoor use; large spaces. 5 teak finished blades that are rated for outdoor use. Can be installed with light kit. 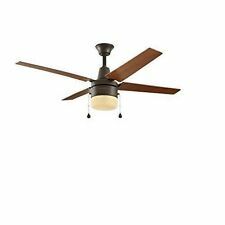 Open box Monte Carlo Discus 52” Ceiling Fan in New Bronze with halogen light kit. Great sleek styling for any room. Great fan at a great price. Model: RV42RB. 42" DC12V Ceiling Fan. Color: Rustic Bronze. With oak blades, stainless downrod and motor housing, and a traditional motor style, this adjustable ceiling fan is great for increasing airflow in compact spaces. A design combination of ceiling fans and electric fans, the Fino 13 in. The Harbor Breeze Waveport ceiling fan features palm leaf shaped blades and frosted glass. Made from heavy duty construction this fan is damp rated and durable so you can enjoy this fan on an enclosed patio or porch year round. Hunter Fan Company 59262 Contemporary Cassius Matte Silver Ceiling Fan, 52"
Includes four-light fitter with clear glass. This Ceiling Fan operates on standard US 110 volts mains power. Four 40W Candelabra incandescent bulbs included. Hunter Bright Brass Finish. Installer's choice three-position mounting system allows for standard, angled or low ceiling mounting. Provencal Gold Finish. Manufacturer Color Finish Provencal Gold Finish. Like all Hunter ceiling fans, this fan can save you up to 47% on cooling costs. To put this in perspective, the wind chill from a Hunter ceiling fan will keep you as cool at 76 degrees as you would be at 82 degrees without a ceiling fan. Impart a sleek, modern look into your room with the 52 in. The 5 ABS fan blades attach to the top of the motor housing, projecting a unique profile and a sophisticated appearance. A 17-Watt fully dimmable LED light is encased into the hub, with a frosted opal twist-on glass cover that integrates seamlessly for a clean aesthetic. Powerful and energy efficient, the 60 in. It is damp rated for outdoor use, making it the perfect choice for covered patios and porches. This Aero Breeze fan also has a Comfort Breeze setting, varying the fan speed to create a natural breeze effect. 40 YEARS OLD - YET BRAND NEW IN THE BOX ! Brushed nickel finish. Installer's choice 3-position mounting system allows for standard, angled or low ceiling mounting. Ceiling fans have one main function which is to get the air in a room or in an outdoor space circulating. Depending on where you install it, the fan can keep the air feeling clean and cooler, allowing you to get a restful night sleep in the bedroom or relax in the living room. With the right fan, you can even save energy as you may not have to run your air conditioner full time. In order to get ideal use out of your indoor ceiling fan, you will want to get the right size fan for the space. Up to 75 square feet of space: The ceiling fan should have a diameter of 29 to 36 inches. Up to 144 square feet of space: The fan's diameter should measure between 36 and 42 inches. Up to 225 square feet of space: The diameter should be 44 inches. Up to 400 square feet of space: The indoor ceiling fan should have a diameter that measures between 50 and 54 inches. What ceiling fan blades are available? Available sizes: The blades themselves come in a number of sizes that often range from 30 to 60 inches. You should note that the longer the blades are, the more air they can circulate. Materials: The blades can be made from a variety of materials, including solid wood or cross-laminated veneer. Finishes: The actual finishes on the blades can range from a natural finish to bleached oak, black paint, faux granite, and white paint, among many others. What ceiling fan accessories should you consider? Downrods: These are slender rods that hang down from the ceiling. They allow the blades to be lowered down to an optimal height. Not all ceiling fans come with this accessory, though they do come separately and in many sizes and finishes. Ceiling adapter: These adapters allow you to mount outdoor or indoor ceiling fans on ceilings that have an angle to them. These ceiling fans often have longer downrods installed on them to lower the blades down to an optimal height. Remote control: You can use a remote control to turn your fan on, off, or adjust the speed without having to leave the coach. Pull chain: A decorative pull chain can be added to match your interior decor. Light kits: Some living room and bedroom ceiling fans can be outfitted with a light kit. These light kits often allow you to add LED or standard bulbs, increasing your lighting in your living space.